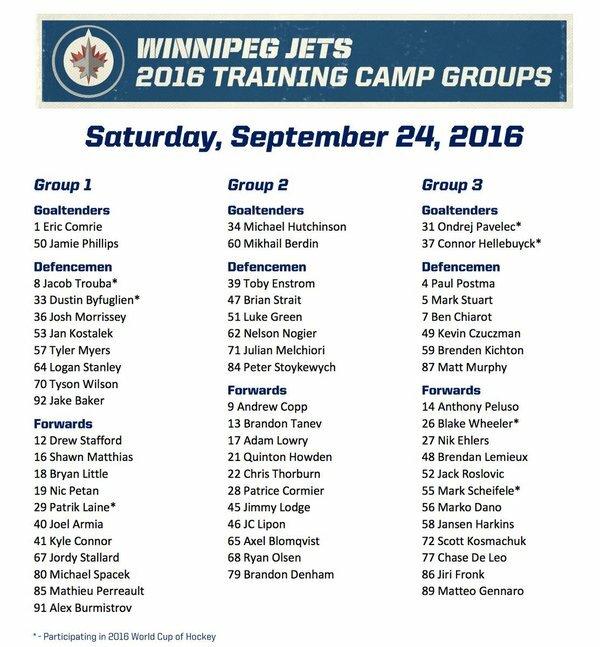 The Winnipeg Jets have announced the details for their 2016 Training Camp, including their schedule, roster, and group assignments. The camp officially starts September 23rd with on-ice testing, but medical evaluations will happen on September 22nd. Invites Antoine Waked and Kristian Rubins did not earn training camp invites from their showing at the Young Stars, but Matt Murphy, former teammate of Luke Green. The groups have not been divided evenly, and there is definitely some skew in the skill with hints of what the Jets are looking at in camp. Three of the Jets top-four defenders are on the roster, with Jacob Trouba, Dustin Byfuglien, and Tyler Myers. Also, the Jets two highest drafted prospects not yet on the roster, Josh Morrissey and Logan Stanley, are included as well. The group almost exclusively contains forwards that spent a good deal of last season in the NHL, with the exclusion of blue-chip Kyle Connor, and two prospects in Jordy Stallard and Michael Spacek. Both of the Jets primary contenders for middle-six centres, Bryan Little and Mathieu Perreault, are on the roster, which is also likely why the main competitors for their wingers, with the exception of Marko Dano, are placed here. Poor Tobias Enstrom sits among a group of defenders that will likely struggle to move the puck out of the defensive zone, although I believe Luke Green has more than he showed at Penticton. The second group’s selection of forwards looks like the front runners the “gritty, two-way” line that Paul Maurice is likely hoping for, plus some AHL fillers. The third group has both Ondrej Pavelec and Connor Hellebuyck. There are two ways you could look at this. You could look at this like Michael Hutchinson is on the outside and this is the Jets 2016-17 tandem, or you could think of the Jets not having confidence in it being Hellebuyck’s time and so he is not given a role of being the primary goaltender. The primary competition for the Jets’ third pair battle it out between Paul Postma, Mark Stuart, and Ben Chiarot, although Morrissey is a contender as well. The forwards for group one contains the Jets’ likely top line of Nikolaj Ehlers, Mark Scheifele, and Blake Wheeler, plus the remaining riffraff that does not fit with the rest. Who Is Winnipeg’s Breakout Star in 2018-19? How did I pull that one off…. I hope they are only looking to see which forward from group two should join the big team and not trying to make an entire line out of that group. Surprised Waked didn’t make camp. Thought he played better than some invites from Penticton.